Redmi Note 5 units have started receiving the latest MIUI 9.5 Global stable build. The MIUI 9.5.4.0.NCFMIFAupdate brings several new features, optimisations, and bug fixes to the successor to Redmi Note 4, which also received the update earlier this week. 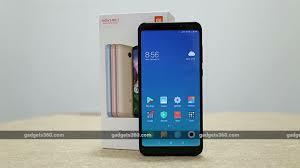 The new Redmi Note 5 software update comes on the heels of Xiaomi announcing that 30 smartphones - including the dated Mi 3 and Redmi 3 - will get the MIUI 9.5 build via over-the-air (OTA) update in April.